← Grapes are in season! Gluten-free blueberry coffee cake thanks to My Baking Addiction. 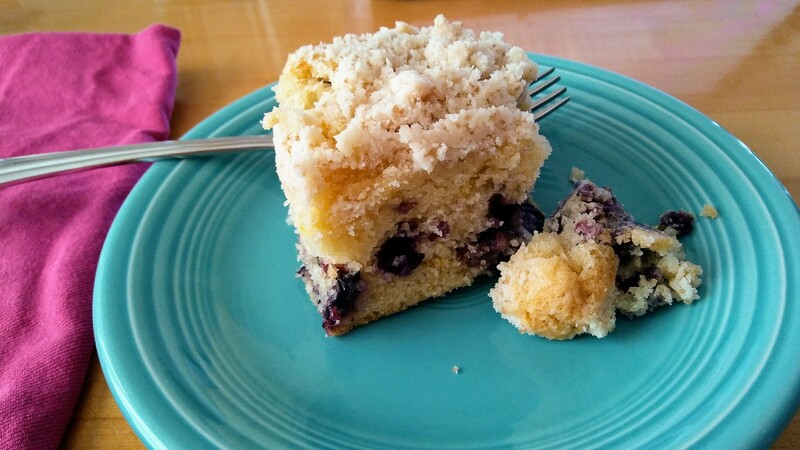 This gluten-free blueberry coffee cake recipe is so outstanding, with fresh berries and a cup of tea, it totally made my day. Here’s the recipe and thanks so much to the author. The recipe is perfect with the exception that you will need to allow for a very long baking time more on the order of an hour and 10 minutes or so. But the top is buttery and the inside has a texture you rarely find in a gluten-free cake. I used Trader Joe’s gluten free baking flour and added xanthan gum. I also mixed the flower with the xanthan gum all together and then divided it for the crumb topping. This entry was posted in Uncategorized and tagged cake, gluten free. Bookmark the permalink. It really is terrific. Freezes well too!